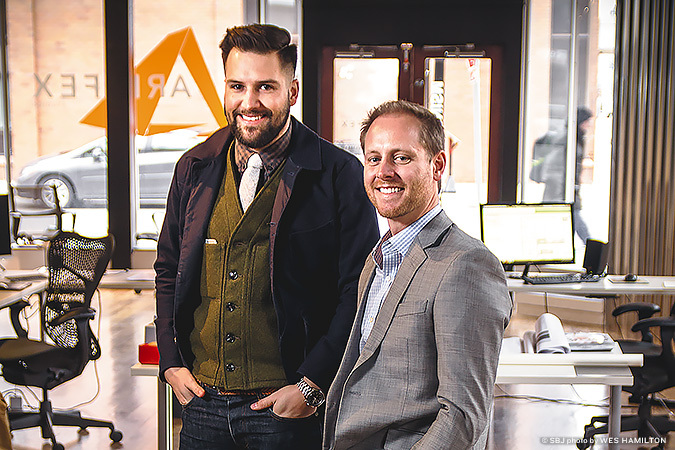 After 18 months in business, Cody Danastasio, Michael Hampton, Tyler Hellweg and Blaine Whisenhunt moved their architecture firm, Arkifex Studios LLC, to 221 South Ave. Danastasio said the Dec. 1 move from roughly 500 square feet at 334 E. Walnut St. to 2,600 square feet, formerly occupied by The Creative Foundry, followed a one-year lease agreement with Kresge Lofts LLC for undisclosed terms. Danastasio said the company’s name is a portmanteau of Ozark and the Latin word artifex for artisan or craftsman. Handling residential and commercial architecture, recent projects include a new Pyramid Foods concept market at 2843 E. Sunshine St. and a new location for Heffington Optical Co. at 1350 E. Woodhurst Drive. Danastasio, Hampton and Hellweg are 2008 graduates of the Hammons School of Architecture at Drury University. Whisenhunt is a sculpture professor at Drury. Hours: 8 a.m.–5 p.m. Monday through Friday. Phone: (417) 213-3334.